b*Stay ahead of the game in training, out and about or at the Ricoh Arena in this Wasps 18/19 Players S/S Training Shirt. 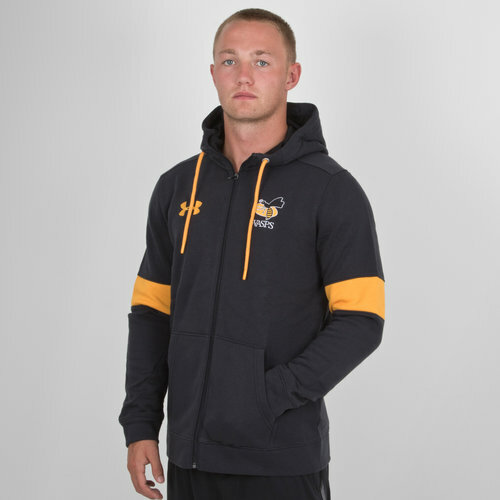 Wasps RFC of the Gallagher Premiership have a new match and training range which comes in the classic black and gold colourway of the wasp. Wasps has won 12 major titles. They were European Champions twice, in 2004 and 2007; have won six English Championships including three in a row from 2003–05; and won three Anglo-Welsh Cups. They have also won the 2003 European Rugby Challenge Cup. Wasps most recent trophy is the 2008 Premiership. This jacket is primarily black with gold bands around the arms sticking to the wasp colour scheme. The UA logo is on the right of the sweat in gold whilst the Wasps badge is on the left. This season has seen the Wasps switch back to the club's original Wasps logo, with a wasp positioned over the top of a yellow ball and the word "WASPS" written underneath.